You may remember that YouTube video that went viral a few years back called “Noah takes a photo of himself every day for 6 years” – it featured photographer Noah Kalina taking a self portrait every day over the course of six years, and then all the pictures are put together in a movie. It’s interesting to watch since people obviously change a fair amount over six years. 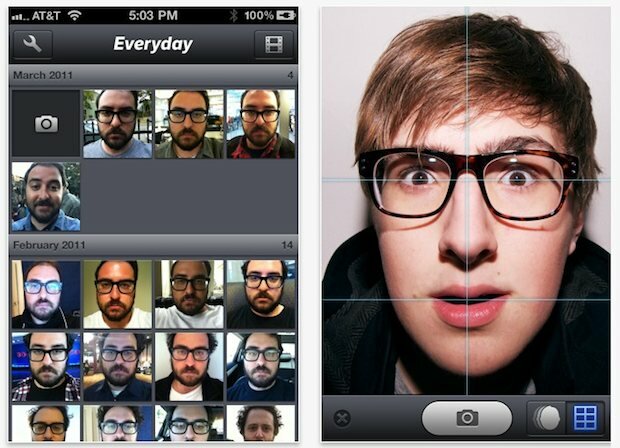 Now there’s an iPhone app that lets you do this yourself, it’s called EveryDay. It’s a simple but fun idea, the app reminds you to take a daily picture, and you line your face up on a grid, the longer you do it the better the end result. It’ll collect all your photos and then you can turn them into a movie just like the aforementioned famous one from Noah Kalina. Watch the preview video above to get an idea, near the end you’ll see how it turns out. Take a picture of yourself. Every day. Set reminders. Get into the habit. The more pictures you have, the better your Everyday app will be. Make a movie. You’d be surprised how great the effect of a time lapse video of your face can be. Watch yourself change, just like a real person. On a related note, we featured Noah Kalina’s portable MacBook Pro setup a while back. I’m curious to know if it can perform multiple sequences; i.e. one sequence of your face, a sequence for another person (watch your children grow? ), a sequence of the view out your window as the seasons change, and the like. Either this app can tell when you’re eating, or this guy never stops eating. So…in other words it’s just another version of Daily Mugshot that has been out since at least 2008.